Nearly 3 out of 10 kids in the United States are either overweight or obese. Why is this? Many of today’s young people lack the tools and resources needed to live a healthy lifestyle. “Play” isn’t the same today as it was when I was little. Our play dates would consist of neighborhood kickball games, riding bikes or hide and seek. We had a blast outdoors. Today I have to worry about monitoring my kids’ TV and video game use. Have you heard of Triple Play? Triple Play is Boys & Girls Clubs of America’s first comprehensive health and wellness program that strives to improve the overall health of members, ages 6-18, by increasing their daily physical activity, teaching them good nutritional habits and helping them develop healthy relationships. When kids live a healthy lifestyle they can improve their overall well-being and self esteem. In this day, self esteem in our young people is so important to uplift because social media can be very negative. It’s extremely important for kids and teens to be healthy and active to achieve a great future. What is Triple Play? Boys & Girls Club of America partnered with the Coca-Cola Company and the Anthem Foundation, to launch Triple Play: A Game Plan for the Mind, Body and Soul. Triple Play is a program that demonstrates how eating smart, keeping fit and forming positive relationships create healthy lifestyles. You can download the Triple Play Parents Game Plan for use at home, because the home is where healthy habits are taught, modeled and reinforced! This game plan is full of fun activities, challenges and games to help you teach and reinforce a healthy lifestyle. I downloaded the Parents Game Plan and decided to lead my kids in a fun activity outside. The winter months are approaching, so we are trying to get the most of our trampoline before it’s gone for a few months! Elbow tag adds a fun twist to regular tag. 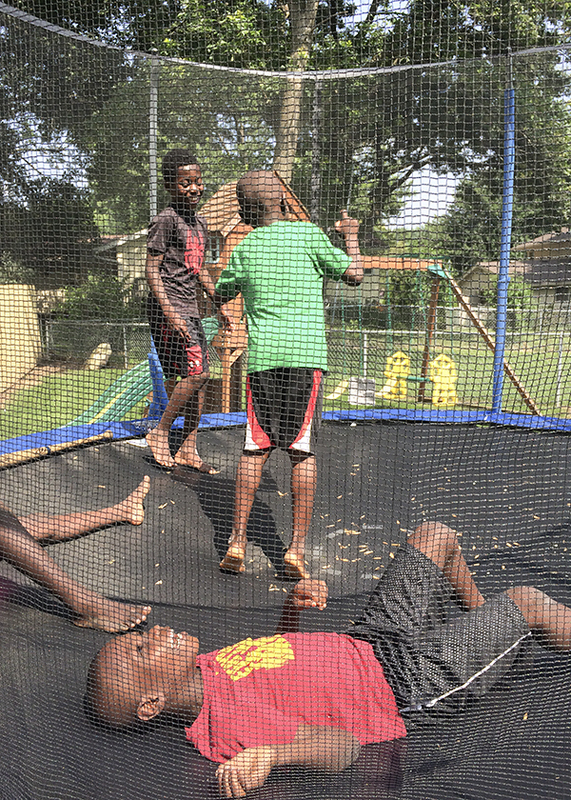 (It’s even more fun on the trampoline!) If your kids are like mine, they might not be able to stop laughing because using your elbow to tag is pretty silly. Decide who “It” will be. All players must place and keep their hands on their hips. It has to tag each player using only his elbows. The last person tagged is the new It. Simple enough! Did you know children need 60 minutes or more of vigorous physical activity daily on most days? That is especially hard in the winter months when it’s tempting to just turn on a movie. Only about one-quarter of youth in the US ages 12-15 are meeting that recommendation. Since launching in 2005, Triple Play has made close to 10 million connections with kids to share the importance of physical activity and proper nutrition through the program’s three components focused on mind, body and soul. So, download your Parents Game Plan and encourage your kids to live a healthy lifestyle for their mind, body and soul. « How Long Should You Cook Pork?